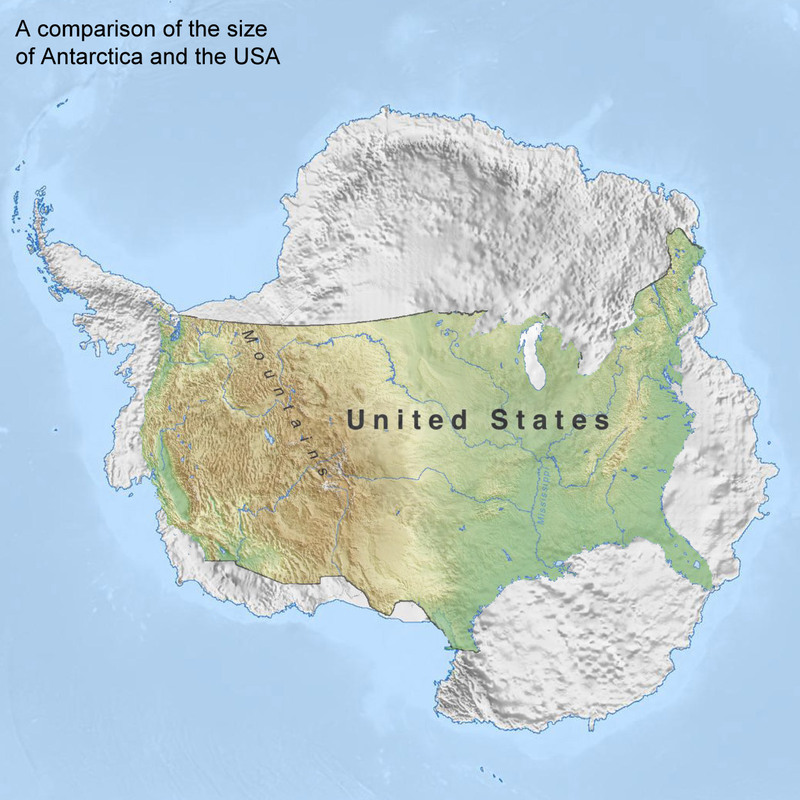 Antarctica is a continent, it is very roughly circular with a diameter of about 2,800 miles (4,500 km). 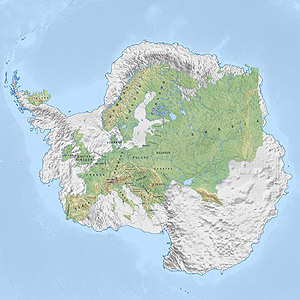 There are no roads for conventional vehicles outside of short non-paved tracks around scientific stations, just a few "airports" that are rough landing strips usually on ice (with the changes and unpredictability that goes with ice) no commercial air or sea ports and no railways. There is no infrastructure where you can buy fuel, get repairs or overnight accommodation other than as part of a (very expensive and very rare) short term adventure tourist package. Find where you are on the map of your country and a place you have travelled to in the past? how far was it and how long did it take you with all the roads, airports, accommodation and other things we take for granted? 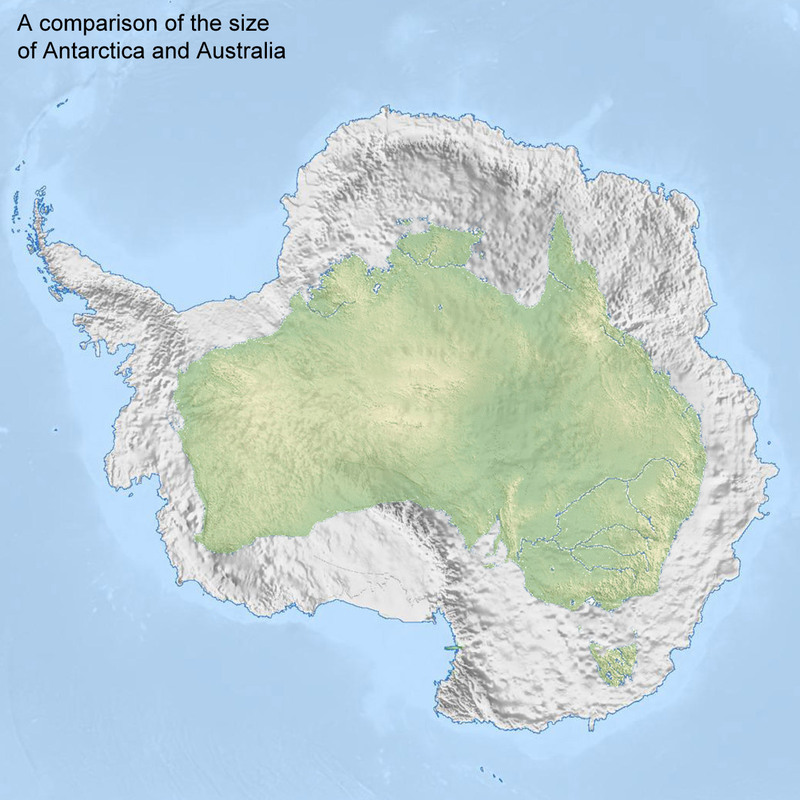 ...and how much of Antarctica would that journey cross? 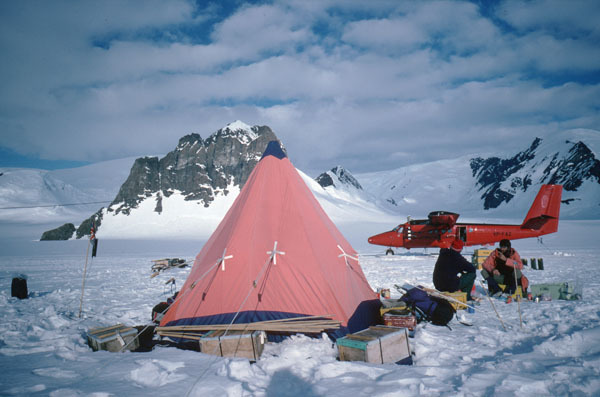 Field parties may camp for up to 100 days in the Antarctic summer months with periodical resupply which is taking place here by air. Food and fuel are dropped off many miles from the nearest base allowing remote and distant areas to be visited, the aircraft will also take out collected rock samples, this field party travel are using snow mobiles and sleds to carry their equipment. 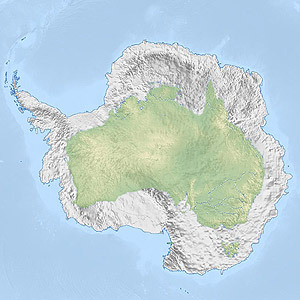 There is no vegetation to soften the landscape across most of Antarctica. 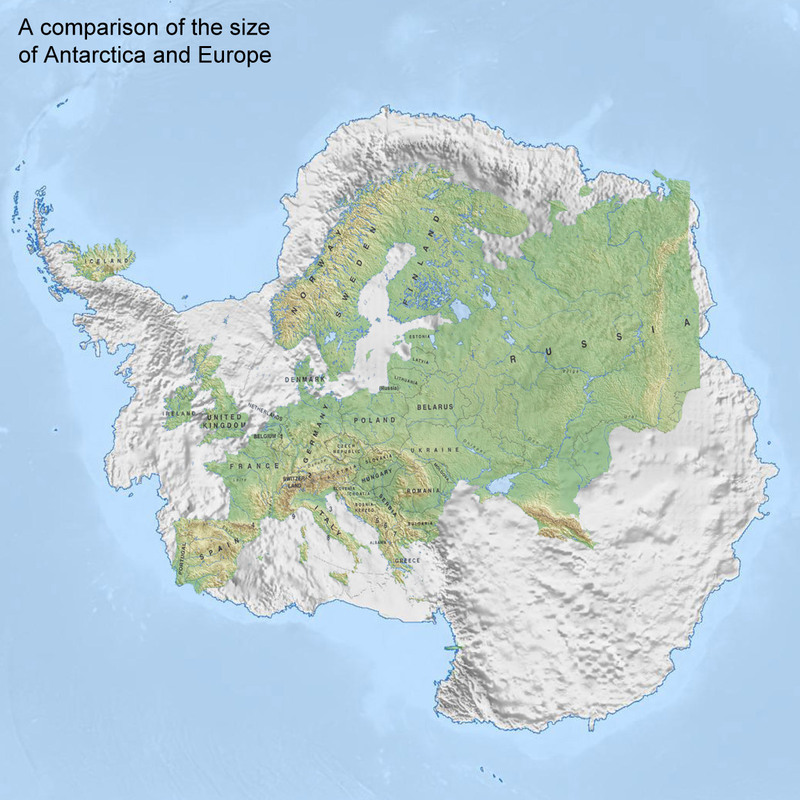 Vegetation builds up soils over time and this smooths rocks and boulders which become buried, this doesn't happen in Antarctica, rocks are bare rocks and more often than not (over 98% of the land area) the ground surface is snow and ice which can sometimes make travel easier or sometimes make it more difficult. 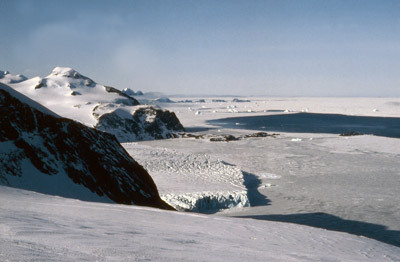 The south coast of Coronation Island in the South Orkney Islands group looking east, the furthest peaks are about 15 miles (24 km) away. To get there on land means dealing with an ice cap, glaciers with many deep crevasses and steep rocky areas. There is some patchy seasonal sea-ice here, this can be unstable and unpredictable. When the sea-ice goes in summer there are many icebergs and the sea can turn stormy or rough in a very short time. The edge of the Dry Valleys area, an inland region of Antarctica showing a small glacier coming down a slope, this picture was taken from a helicopter, the glacier is a few miles wide, the mountains in the distance 10 to 100 miles (16 - 160 km) away. 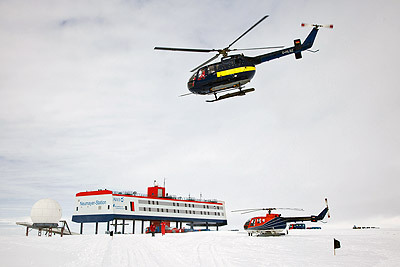 Helicopters are great (but expensive) for short journeys in calm weather, they are very useful for relatively short trips near to scientific stations across difficult terrain. How could you travel over this terrain in these two pictures safely? 1 - The snow or ice surface. This can change over a short time, overnight and from one day to the next. 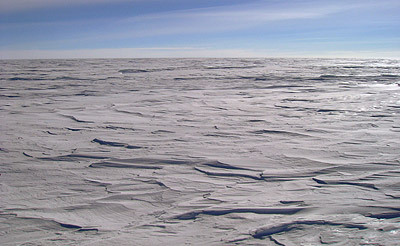 If it snows or blows and sastrugi forms, if the temperature rises and makes the surface softer or even start to melt, if ice flowers form on a hard surface or if a soft part-melted surface freezes hard again it can drastically change how quickly and easily you can move over the surface, both for good and bad. 2 - The weather. Temperatures can fall or rise and even though they are often all below freezing point, there is a big difference between -10C, -20C and -30C and what you can comfortably and safely do at each temperature. The appearance of a blizzard is an ever present possibility and results in having to stop and wait until it passes and you can continue again, this might take a day or two, or even a week, or two. Even on a calm and not especially cold day, low cloud can result in white-out conditions where it is like being inside a ping-pong ball making dangers such as crevasses much harder to see and slowing progress significantly. "The following day was also bright and sunny, but the sledging was terribly heavy. The sun had thawed the surface of the saline snow and our sledge runners had become saturated with soft water. 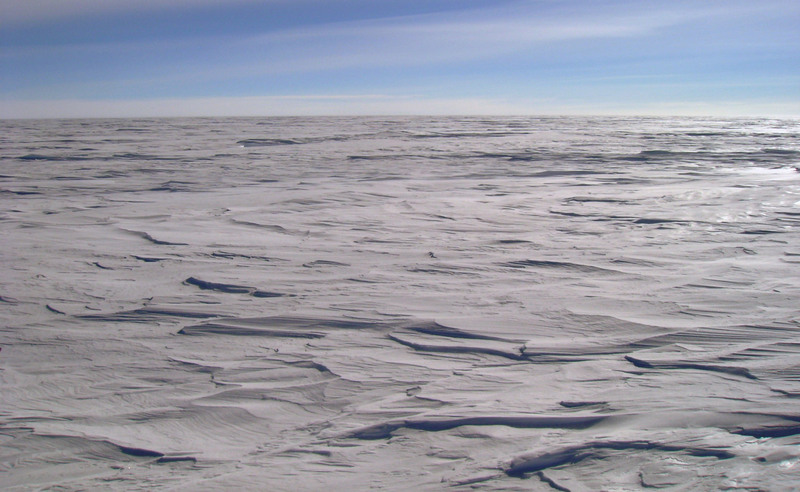 This is what most of Antarctica looks like, an endless white ice-cap, topped with wind blown snow called sastrugi that look like small waves on the snow surface, these typically vary from about 1-20cm (0.5 - 8 inches) in height though can grow to a metre or more. 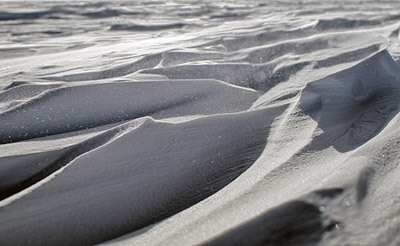 Sastrugi are irregular ridges of snow that form along the direction of the wind. They are surprisingly hard which makes them difficult to travel over, especially when going across them. They constantly re-direct skis of all kinds, make for a bumpy and slower journey, and cause greater wear and tear on vehicles and sledges. "The next two days were uneventful, except for the fact that we occasionally had extremely heavy sledging over screw pack-ice and high and long sastrugi. The latter were from two to three feet high, bounded frequently by almost perpendicular sides, and as they trended from west to east and our course was from south to north they proved formidable obstacles to our progress, and capsizes of the sledges were frequent. 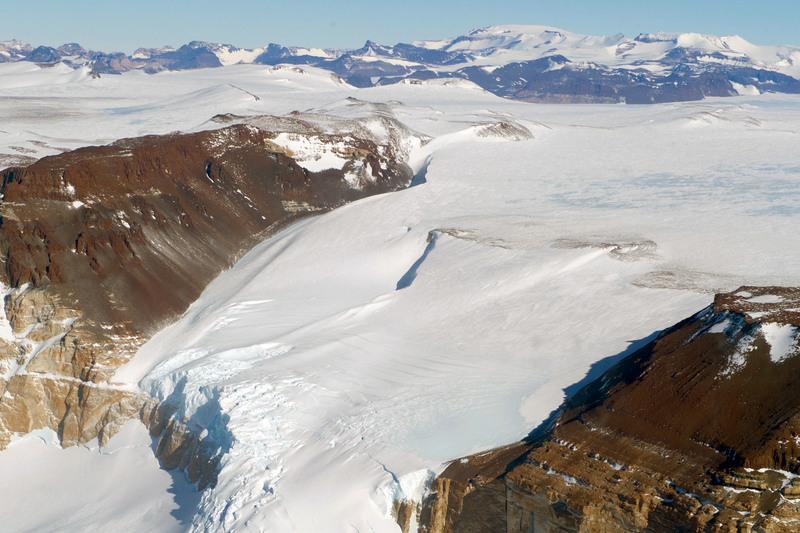 Crevasses - one of the biggest and commonest hazards when travelling overland in Antarctica. These are cracks in the ice up to hundreds of feet deep that can be covered at the top by snow that blows over to form a weak bridge. 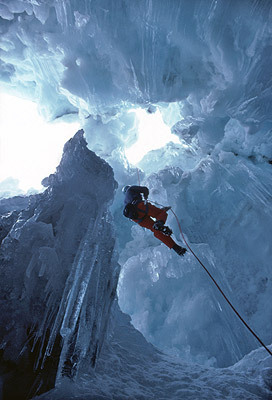 Anyone passing through such terrain has to be vigilant, trained to spot and avoid crevasses and should know how to perform a crevasse rescue should someone fall in one. 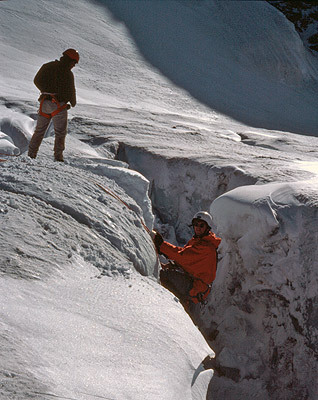 Many lives have been lost by people and vehicles falling into crevasses. 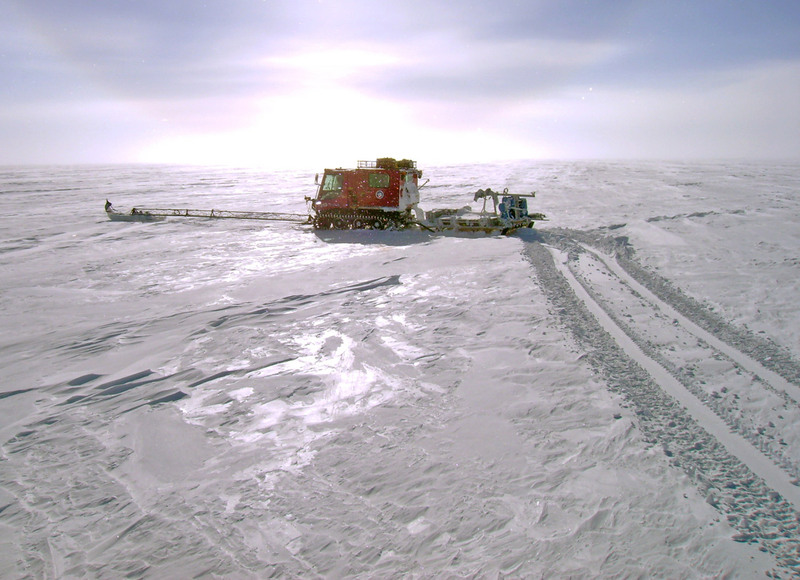 This vehicle is fitted with a crevasse probe held on the end of a long arm in front of the machine. A sensor device is mounted on a plywood disc above an inner tube, it triggers an alarm in the cab when a crevasse is detected. Before heading out to cross glaciers or icecaps where crevasses may be found, training takes place to ensure that all members of the party are able to rescue the others in the case of anyone falling into a crevasse. Abseiling as part of crevasse rescue training, note how large it is inside, with a relatively small hole exposed at the surface, and even that was bridged with snow when we arrived. Sea ice can be an excellent surface for travelling over if it is hard and strong, it can also be quite treacherous if it isn't and you're not sure. The ice can be broken by a storm or waves resulting in countless separate ice floes which can be taken by wind and tides many miles from where it was. A rare though not unknown event is when a large iceberg trapped in the ice turns over and breaks up the ice for miles around. 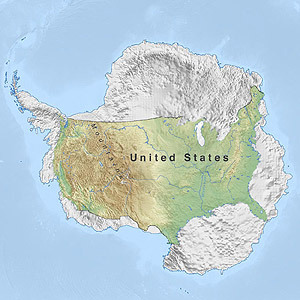 On the positive side, sea ice can speed travel up, because there are no hills and it can allow you to go the most direct route avoiding glaciers, cliffs and rocks, it can turn hundreds of square miles into a flat, hard and excellent surface to travel on, though it usually doesn't last long like that before other factors change the surface. Most of all, don't spend the night camped on sea-ice, and don't travel across it in strong winds. Walking on sea-ice, this is pack ice, very rough and uneven, a slow and difficult surface. The dark area in front of the figures is a pool of sea water a frequent hazard. 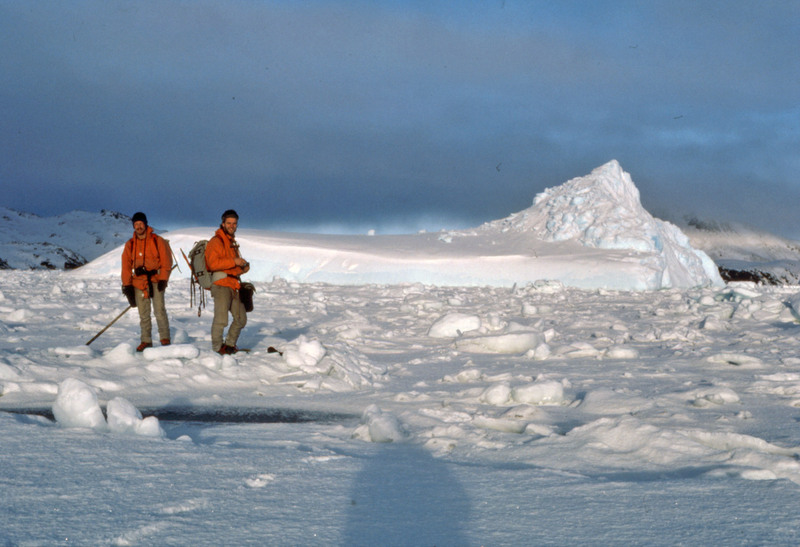 The long pole the man on the left (my mate Paul) is carrying is used to probe suspect ice to see if it is safe to walk on. 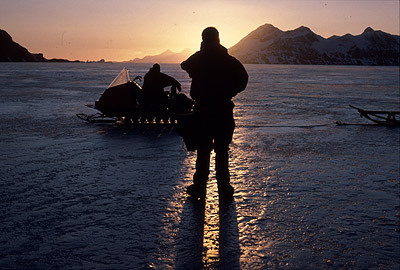 Travelling over sea ice by snow mobile, this is a great surface for travelling on, it is hard and smooth, a little too slippery if it was a slope, but as it's flat, the snow mobile can grip well enough to travel at top speed with no hazards for miles. Vehicles used in Antarctica tend to be those that are behind the cutting edge of technology, using yesterdays engineering. This means they are proven in use and are easier to fix when they break. If your snow mobile or tractor unit breaks down deep in the field, it may be days until someone can fly out with a mechanic or spare parts to fix the problem. An easier to fix vehicle makes more sense and somewhat cruder technology will be less affected by the harshness of Antarctic conditions in the first place. This means that expensive to deploy deep field units can work more effective days. Fixing a broken sled in the field, a pit has been dug to allow the split side of the large plastic sled to be accessed before pulling it free of the ice and possibly causing further damage. Snow mobile with plastic cargo sled, background, with passenger sled, South Pole station. Such snow mobiles are used in and around bases and also by field parties for much more disntant field trips. A snow mobile being used to pull radar equipment mounted on a sled. This radar is designed to measure the ice depth and profile more accurately though over a smaller area that can be done using aircraft. A heavy tractor unit modified for deep field cold weather use, These vehicles are used far from base stations and will pull a chain of sledges. 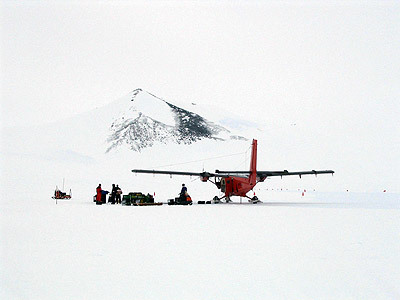 A Delta, a vehicle used to ferry people from the airstrip to McMurdo base and back again across the sea ice and rugged terrain, basically an "ice bus". Two Antarctic workhorses - left an LC-130A (a ski equipped Hercules) and right a Twin Otter. Both have a reputation for toughness and reliability. The Twin Otter's ability to take off and land in a short distance on skis means that these aircraft are used for medium length flights such as resupplying deep field parties that travel by snowmobile and sled, they have been used for over 40 years now. 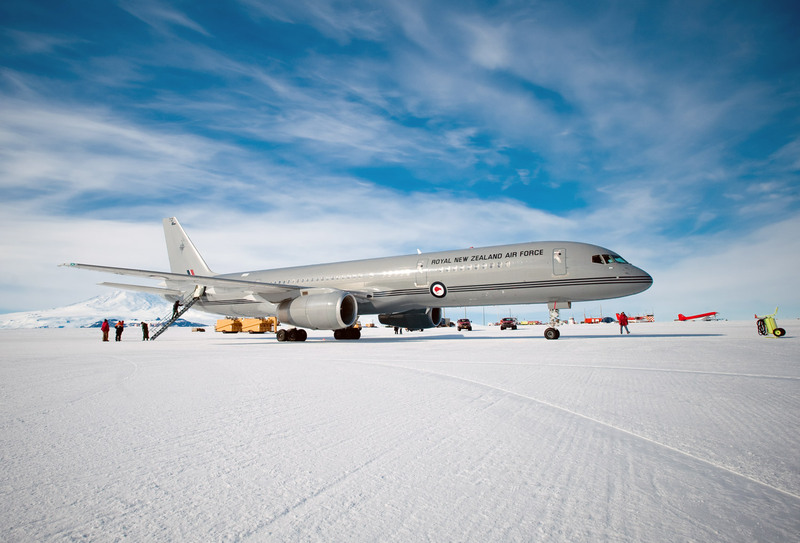 The LC-130's have been used in their role for intercontinental flights from New Zealand to Antarctica and the South Pole for over 50 years. 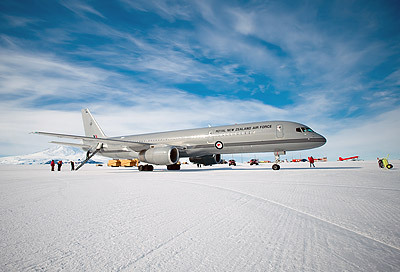 A Boeing 757, in recent years, more conventional passenger jets have been used to reach Antarctica, these require better prepared ice runways with more frequent attention to land on with their wheels. Helicopters are useful for shorter trips over difficult terrain, they are also used extensively by ships. The two in this picture were both subsequently written off by making separate hard landings in white-out conditions, highlighting the limitations on helicopter use.